Allamanda is an easy-to-grow flowering shrub from the tropics that offers a steady display of golden-yellow flowers all spring and summer long. It is considered to be a favourite amongst many plant growers because of its heat tolerance and long-season bloom. The flowers look like ‘trumpets’ and ‘bells’, that can create a musical symphony in your garden. This spell-bounding beauty grows well in containers and landscapes both. Sunlight: Partial sun/shade. Can be grown indoors with bright light. Care: Water regularly, apply nitrogen fertilizer to soil occasionally. Pests: Aphids and mealybugs; Ward off with general pesticide. The plant contains a poisonous, milky sap – all parts of the plant are considered to be toxic. Thess plants under ideal conditions, can grow rapidly and get out of control, making pruning essential. Allamanda plants can become shrubs by pruning. Allamandas are popularly used as ornamental plants. They can be grown in sheltered areas as well as indoors – with care – as potted plants. With this, we have come to the end of our blog. We hope that you liked the read, and would want to grow these yellow beauties in your green sphere. The pomegranate is a naturally dense, deciduous, bushy, multi-stemmed shrub that typically grows to heights of 10 to 12 feet and bears highly coloured fruit with many juicy seeds inside. Pomegranates have been found to cut the risk of prostate cancer. Eating pomegranate seeds can help fight inflammation and the related inflammatory disorders. Pomegranates work wonderfully well in strengthening the gums and fastening loose teeth. direct sow after last frost, By simple layering. sow as soon as possible. Pomegranates are used in cooking, baking, meal garnishes, juice blends, smoothies, and alcoholic beverages, such as cocktails and wine. Pomegranate can be used to give a glistening effect on the skin. It can fight against nasty pigmentations, dark spots and ageing effects that imparts dullness to your skin. Here are 5 types of quick masks that you can make at home to invigorate your skin. With this, we have come to the end of our blog on pomegranate. We hope you had a good read. Do you like scents? If yes, then this is the flower for you! Tuberose has a fragrance that is rich, exotic and at the same time is not overpowering. Not only is the fragrance a delight to your senses, but its appearance is pleasant and gorgeous too. Tuberose has long, narrow, light green leaves, and the plant grows about 25-30 cm tall. The flowering stalk is about 75-100 cm in length land has 25-50 florets spike. Tuberose oil can relieve a person of stress and anxiety. It can calm down the agitated nerves by giving a soothing sensation. The oil extracted from tuberose can also help in reducing inflammations relating to respiratory and nervous system. This essential oil also stimulates and increases blood circulation throughout the body. Varieties: Calcutta Single, Mexican Single, Phule Rajani, Prajwal, Rajat Rekha, Shringar, Khahikuchi Single, Hyderabad Single, Pune Single, Arka Nirantra, Calcutta Double, Hyderabad Double, Pearl Double, Swarna Rekha, Suvasini, Vaibhav. Sunlight: This requires full sun but can be grown indoors with bright light. Water: As tuberose grows, provide roughly 1–1.5 in. (2.5–3.75 cm) of water once a week. Tuberose prefers this to more frequent watering in smaller amounts. Pests: Thrips and aphids are usually disrupt the plant. Use general pesticides to fight them. Harvest: – For loose flowers, individual flower is plucked regularly which are used for various purposes whereas for cut flower the spike is cut from the base so that longer spike is available. Propagation: Bulbs are used for propagation. With this, we have come to the end of our blog. We hope that you liked the read. Cornflower is a common wildflower that has been cultivated as a garden flower for centuries. Originally a native of the near East, cornflower now grows wild over much of Europe and the temperate regions of North America. The cornflower gets its formal name from a minor goddess, Cyanus, and its genus name from a mythical Centaur whose name was Chiron. Common name: Cornflower, bachelor’s button, bluebottle, hurt sickle or cyanic flower. Design ideas: Borders, cut flowers etc. Flowering season: They generally bloom in the late Spring and early summer. Flower: The flowers are most commonly an intense blue colour, produced in flower heads, 1.5-3 cm diameter, with a ring of a few large, spreading ray florets surrounding a central cluster of disc florets. The blue pigment is protocyanin, which in roses is red. Foliage: Cornflower has clearly narrower leaves. Sunlight: Full sun around 6-8 hours of direct sunlight. Water: Regularly whenever topsoil turns dry. Keep the soil moist but not soggy, to avoid rot and fungal diseases due to overwatering. Sowing season: So cornflowers from early to mid spring for early summer bloom. Also sowing fall in climates with mild winters. Pests: Aphids and powdery mildew can be a problem attimes. Remove aphids manually with a hard spray of water. Powdery mildew is identified by a white coating on the leaves and wilted, brown foliage. Remove infected plants and burn them to prevent the disease from spreading. Harvesting: Cornflower make good cut flowers. Pull up the plants in mid to late summer when they no longer look attractive. Propagation: The best way to propagate cornflower is to sow the seeds directly into your garden or lawn during fall or as soon as the weather allows for spring germination. 1.Cornflower seeds need complete darkness for germination to occur. 2.Allow the soil to dry out slightly between watering. Do not allow the soil to become too dry, or the plants may flop over. However, cornflower is drought tolerant and will easily spring back from under watering. 3.Feed cornflowers once per month during the spring and summer months using a balanced flower fertilizer. Refer to the manufacturer’s instructions for proper dosage, and apply half the recommended dose. Cornflower can be invasive if the soil is too fertile, so avoid over-fertilizing. 4.Remove spent flowers as they fade to encourage the growth of new flowers, prolong the blooming period of the cornflower plants and decrease the number of self-sown seedlings. 1.Dried flowers are used to make medicine. 2. You can make cornflower tea to treat fever, constipation and chest congestion. 3. Women can take it to treat menstrual disorders. 4. Cornflower can also act as a tonic for puffy eyes. Here’s how. With this, we have come to the end of our blog. Hope you had a good read! Green is everywhere. It’s the most common colour in the natural world, It’s the colour we associate with the environment, balance, nature, spring, and rebirth. It’s the symbol of prosperity freshness and progress. Green buildings are an attempt to facilitate a transformation into a more sustainable future. HERE is a list of top 10 green buildings in India. Let us shed light on why it is important to have green buildings in our ecosystem. Energy saving: energy saving can be enhanced by the use of energy efficiency technologies and products, thus achieving sustainability. Use of natural ventilation and lighting can reduce energy consumption for air-conditioning, ventilation and lighting in buildings. Many of the renewable energy sources are free and inexhaustible, offering greener resources and economically viable options. Waste reduction: Installing waste separation facilities such as bins or racks in buildings together with publicity and promotional activities directed to the occupants of the building can help to recover more materials for recycling and reduce waste requiring disposal. Saving water: this can be done by installation of flow restrictors at water taps, and optimized timing self-closing taps or sensor taps in public lavatories and washing rooms. Reduction of water pressure of the plumbing systems to the lowest practical level, installation of dual flush cisterns (a choice between “full flush” and “half flush”), provision of reclaimed water systems for toilet flushing, cleaning and irrigation. From an economic and social point of view. Economic benefits: It reduces operating costs and improves the productivity of the occupants. Through adaptation of such buildings, the market for green product and services also rises. When we consider the steps of action, we need to think deeper than just greenifying the environment. Our goal should be to strike a balance by establishing a sustainable environment by not disturbing the elements of nature. Our efforts will not just cater to a better living place for us, but to the plants and wildlife around us as well. If this sounds too philosophical and too big to start with, we need to take baby steps before attaining our bigger goal. We can start small, and we can do that by making small changes within our home. A few green changes here and there in our abode can create ripples of difference and make us beam with pride. We are living in a world today where lemonade is made from artificial flavours and furniture polish is made from real lemons. Lemons are a favourite all over the world and an essential food in kitchens everywhere. In this blog, we will talk about the benefits of lemon, its characteristics and some home made remedies that you would surely love. Lemon is a good source of vitamin C.
The juices in lemon greatly improve your skin tone and quality. For all the fitness lovers, lemon is the “it”thing. This also helps prevent kidney stones. Design ideas: Can be grown outdoors and indoors. Propagation Methods: From seed; winter sow in vented containers, cold frame or unheated greenhouse. Seed Collecting: Allow unblemished fruit to ripen; clean and dry seed, Seed does not store well; sow as soon as possible. Heavier lemons will have the most mineral content and sugar, thus thick-skinned lemons will be lighter than thin-skinned lemons and will have less sweetness and fewer minerals. The ones with the most juice will have finely-grained texture peels. Lemons should be fully yellow; the ones with green tinges have not fully ripened and will be very acidic. Over-ripe lemons will have a wrinkling look, soft or hard patches and will not be a vibrant yellow. Lemons stay fresh kept at room temperature (not in sunlight) for about seven to 10 days; or store them in the refrigerator crisper for about four to five weeks. “When life gives you a lemon… squeeze it, mix it with six ounces of water and drink twice daily. A bowl of fresh lemons will add fragrance and colour to a room for days. To reducing sodium intake, squeeze fresh lemon on salads, steamed vegetables, soups and stews. Roll a lemon on the counter a few times before squeezing to maximize the amount of juice. Lemon juice can be stored for later use by putting freshly squeezed lemon juice in ice cube trays until frozen, then store them in containers in the freezer. Dried lemon zest should be stored in a cool and dry place in an airtight glass container. The zest of fresh lemon is a wonderful addition to cakes, cookies and in vegetables. Lemon has dual benefits. Not only does its juice have so many benefits, its peel also can be beneficial in many different ways. Watch the video below to know! So, with this we have come to the end of our blog about lemons! We hope that you had a good read 🙂 Keep consuming lemon and stay spirited forever! Curry leaves are the shiny, dark green, aromatic leaves of a tree from the citrus fruit family that release a deliciously nutty aroma when fried in hot oil. Curry leaves are often seen decorating the plates of South Indian households. Here is an interesting and quick recipe that your hands would love to try. Apart from lending its aroma to a variety of recipes, it also has medicinal values to impart. 2. These distinctly aromatic leaves also have antioxidant properties. 3. Curry leaves also have the capacity to fight cancer. You can also juice curry leaves and consume it to have better hair and vision! Seed Collecting: Allow unblemished fruit to ripen; a clean and dry seed, seed does not store well; sow as soon as possible. You should be careful around seeds though, they can be poisonous if ingested. Propagation: Seeds must be ripe and fresh to plant; dried or shrivelled fruits are not viable. One can plant the whole fruit, but it is best to remove the pulp before planting in a potting mix that is kept moist but not wet. Stem cuttings can be also used for propagation. Curry leaves’ aromatic characteristic properties find use and application in soap making ingredient, body lotions, diffusers, potpourri, scent, air fresheners, body fragrance, perfume, bath and massage oils, aromatherapy, towel scenting, spa’s and health clinics, incense, facial steams, hair treatments etc. Here is a quick video on homemade curry leaves oil, that can make your hair lustrous and thick. With this remedy, you won’t have to rely on the expensive shampoos and fancy hair oils that brands and big salons sell to buy your trust. You can be your own hair stylist! Deep colour and a whole lot of crunch define beetroot. Its overpowering colour can turn any recipe shocking pink. The vegetable owes its colour to a pigment called betanin which is often extracted to create natural food colouring and dyes. Interestingly, beets were also used to add colour to wines back in the day. 1.Helps in detoxification: Beetroot is reckoned to be a great purifier. It detoxifies your body by pulling the toxins into the colon from where they can be evacuated. 2 It is low in fat and calories: Although it has a high sugar content, it is low in calories and almost fat-free. Since it is loaded with fibre it makes you full without consuming too many calories. 3. It is rich in antioxidants: The antioxidants present in beetroot reduce the oxidation of bad cholesterol, protect the artery walls and guard against heart disease and stroke. 4. Its good for hair: Beetroot is actually one of the best home remedies to fight the flakes and an itchy scalp. Varieties: Ooty 1, Detroit Dark Red, Crimson, Globe and Red Ball. It needs to be water regularly especially when the top-soil turns dry. It is important to keep the soil moist but not soggy. This is required to avoid rot and fungal diseases that can happen due to over-watering. July & August are the best seasons to sow beetroot. Line sowing is required for this vegetable.Sow beetroot seeds at 2cm depth and each seed should be sowed at an interval of 5 to 10 cm. There are some pests and diseases that attack beetroot. We will speak about them and also the methods to prevent them. Flea beetles are small jumping insects (similar in appearance to fleas) that can damage plants by chewing numerous small holes in the leaves. Leaf miner and flea beetle can be controlled by spraying Malathion 50 EC 2 ml/lit. This results in significant losses, particularly in late summer when conditions are favourable (high temperatures, high humidity, longleaf wetness periods at night). Beetroots fail to grow to full size when the disease is severe. Cercospora leaf spot can be controlled by spraying Mancozeb at 2 g/lit. b) It can kill and stunt plants to result in significant yield losses. This can be controlled by spot drenching with Carbendazim at 1 g/lit. Within 60 days, the roots are ready for harvest. The Beetroots are harvested by digging the sides of the roots and by loosening the roots from the soil and then it is pulled out from the soil. In 4 cm apart from the crown, the leaves are twisted and removed from the roots. Place the disk, stem side up, into a bowl or saucer of shallow water. Refill the water if it gets too low. The water level should be just under the stems. When they grow to the size you like, use beet greens for salads, stir-fries, quiches, or anywhere you would be using spinach, chard, collards or kale. 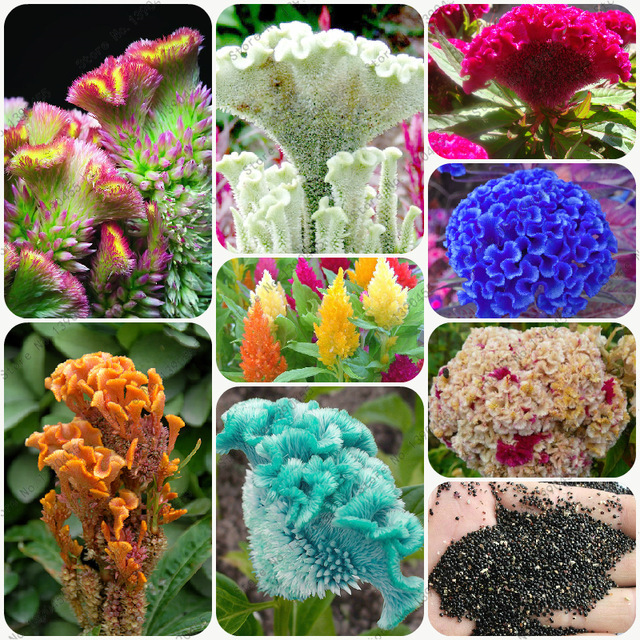 Flowers of celosia are known as wool flowers or cockscombs. They have unusual flowers that can bloom up to 10 weeks. These flowers can have red, pink, purple, gold or bicoloured blooms. When many celosia flower blooms are next to each other. They collectively resemble fire, which is why their name Celosia, which means burning in Greek was chosen. The common name of cockscomb comes from the bloom’s resemblance to a rooster’s comb. The varieties of this plant come in many sizes, from only a few inches up to about 5 feet high. Celosia plants are classified into three groups: a crested type (Celosia cristata), a plume type (Celosia plumosa) and a spike or wheat type (Celosia spicata). Flowering season: Mid-summer or mid-fall. Sunlight: Full sun locations allow cockscomb Celosia to grow taller. But cockscomb may grow in only partial sun, so it can happily exist when partially shaded by taller plants. Water: Celosia loves moist soil. Although the plant can tolerate short periods of drought but it grows much better when soil remains slightly moist. While watering, remember not to overwater plant to avoid leaf spots, stem rot, root rot and other fungal diseases. Sowing season: Cockscombs like warm weather. The seeds will typically not germinate unless the ground temperature is at least 60 degrees Fahrenheit. If you live in an area with cool springs, start the seeds indoors four to six weeks before the expected last frost. If your area has longer summers, plant the seeds directly in your garden after the last expected frost. Sowing method: The pretty looking plant thrives in most of the soil types, but it is better to use soil that is rich in organic matter and drains well. The pH level of the soil required should be around 6 to 7. Care: Caring for this plant is simple and easy, with slight maintenance you can get prolifically blooming celosia flowers in your home and garden. Pests: Spider mites and aphids are commonly found in these flowers. To avoid infection keep your plant healthy, water in limit and ensure good drainage. Spray with organic pesticide and fungicide if necessary. inches apart and plant young flowers outdoors after the last frost has passed. So with this, we have come to the end of our article. We hope you had a good read! Bitter gourd is actually not a vegetable but fruit. The fruit of bitter gourd is used for consumption and various medicinal purposes. Bitter gourd consumed as juice also offers many medicinal benefits. Bitter gourd contains iron, magnesium, vitamins, and potassium. The calcium and potassium content in it is twice that of spinach and banana. Common names: bitter melon, papailla, melao de sao caetano, bittergourd, balsam apple, etc. Helps in maintaining blood sugar levels – Bitter gourd contains an insulin-like compound called Polypeptide-p or p-insulin which has been shown to control diabetes naturally. Lowers bad cholesterol levels – It maintains the blood pressure of the body as it is rich in potassium, which absorbs excessive sodium in the body. This lowers heart risks. Improves skin and hair: Bitter gourd juice has powerful anti-oxidants along with vitamin A and C which prevent premature skin ageing and diminishes wrinkles. Bittergourd comes in a variety of shapes and sizes. The cultivar common to China is 20–30 cm long, oblong with bluntly tapering ends and pale green in colour, with a gently undulating, warty surface. The bitter melon more typical of India has a narrower shape with pointed ends, and a surface covered with jagged, triangular “teeth” and ridges. It is green to white in colour. Between these two extremes are any number of intermediate forms. Some bear miniature fruit of only 6–10 cm in length, which may be served individually as stuffed vegetables. Height: tendril-bearing vine grows to 5 m.
Foliage: Bitter melon leaves are vibrant green and are attached to a vine with long thin stems. Leaves are made up of 3 to 6 veined lobes and have jagged edges. Sunlight: It grows best under full sun, therefore requires around 6-8 hours of direct exposure to sunlight. Water: It should be watered regularly especially when the top-soil turns dry. It is important to keep the soil moist but not soggy. Over-watering can cause rotting and fungal diseases. Sowing season: Bittergourd plant care dictates planting when there is no danger of frost and temperatures have warmed. Sowing method: Grown as an annual crop, seeds can be obtained from a number of suppliers and direct sown in almost any soil type, although growing bitter gourd seeds do best in deep, well-draining, sandy or silt loam. Bittergourd is susceptible to most of the same diseases and insect attacks that plague squash and cucumbers. Bittergourd should be stored between 53-55 degrees F. (11-12 C.) at a fairly high humidity with a shelf life of 2-3 weeks. It is important to keep the bitter gourd fruit away from other ripening fruits to avoid hastening the ripening process. Mosaic virus and powdery mildew afflict bitter gourds are common pests. For this, commercial producers often cover the developing fruit with paper bags. Propagation is through direct seeding and transplanting. The best medium for the seeds is a fertile, well-drained soil with a pH ranging from 5.5 to 6.7, enriched with organic matter, such as compost or dried manure. But it will tolerate any soil that provides a good drainage system. The soil must be prepared well by adding organic matter before planting. So, with this we have come to the end of our blog. Hope this enhanced your knowldge on bittergourd, and you would now run to your kitchen to experiment with it.